Summer storm - Let's keep that in the sanctity of your brain, shall we? There I was last week waxing lyrical about the joys of being eleven floors up in a thunderstorm. No such joy today; in fact today's effort was downright frightening. Brisbane got smashed by a "super cell" created when two storm cells met up. At 3.30pm the sky was cloudless, although the BOM radar showed storms moving in from the south and west; by 4.40pm it was as dark as night outside. And then the hail came down, crashing into the window next to me with so much force I thought for sure I would end up with a lap full of broken glass at any second. The window was shuddering under the impacts, the hail was that large. When I left work I had to walk with care as the footpath was covered in leaves stripped from the trees. Buses were running incredibly late, due to the roads in and out of the city being in gridlock, but at least they were running - the trains were stopped completely with the tracks totally flooded. As it was, it was 7.30pm before I made it home tonight. By far the biggest, most damaging storm I've ever seen. I can't imagine what it would be like living through a cyclone. And I'm so glad my car was safely at home. I had to immediately send the vids on to MG and a bunch of our mates who are weather geeks. Thank you, so am I. "Suddenly" is right - an hour earlier I had been commenting that I was feeling rather warm from the sunlight coming through the window behind me and then bam! Out of nowhere. EEk! I'm glad you and your possessions are ok! My cousins in Colorado were at the mall years ago when a sudden hail storm came up. By the time it was over, everyone went outside and a LOT of the cars had dents. SCARY. Thank you. By yesterday afternoon there had been over 15000 insurance claims lodged for damage to vehicles and property. I'm sure that number will continue to rise for a week or so. Wow. I had absolutely no idea that you could get hail in what I thought was a part of the tropics! That gurgling at the start of the second is making me need the loo. Erm. TMI, sorry :) But seriously, I would not like to be out in that, in that, let alone driving. *short pause for collapse at the language* - not heard that particular phrase (0:52) before, and it is is so perfectly apposite! Glad that you are okay - very very glad after watching these! Hail's actually not unusual at this time of year, coming in conjunction with a storm after a sultry day. I didn't know that hail also occurred in colder climates. Colourful language, yes, and so expressive! Oh wow, how brilliant is that! (In a glad-everyone's-okay-and-your-car-was-safe kind of way. *g*) The size of the hailstones in that vid - and the wind in the other vid! My sister's car (in Melbourne) was a write-off a few years ago after being hit by massive hailstones - I wasn't sure I quite believed how it could be, but I can imagine it now! Mind you, I can never quite get my head around hail in Brisbane anyway. In the summer (okay, nearly-summer)! 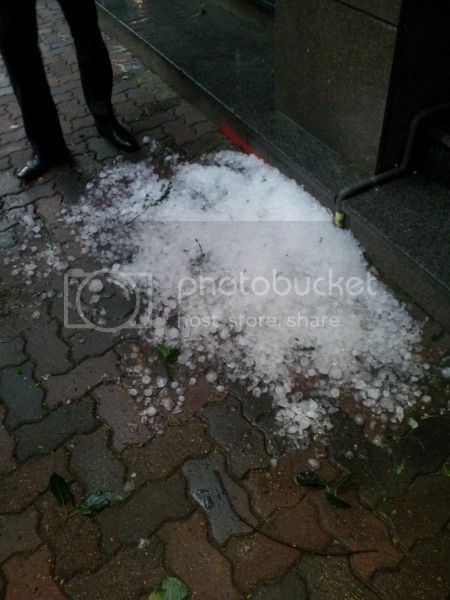 It WAS kinda brilliant and definitely the biggest hail I've ever experienced. My sister's car also copped a hammering a few years ago, not quite written off though. She had huge dents in it. And as I explained upstream, this is the time of year we expect to get hail and I find it odd that other climates get it at other times *g*. In St. Louis in summer, we call that "your average Tuesday afternoon." In other words - that's some right dreadful weather, and glad you're safe. That's a worry! I wouldn't like to go through that on a regular basis. Just trawling through twitter under the hashtag #bnestorm and one comment both made me laugh and was SO appropriate - "Did someone order an apocalypse?" That really was a doozy of a storm! We were getting ready to batten down the hatches, but it went round us and up to Brisbane and points north. We did get a bit of rain at first, but then a lot through the night. So glad you weren't caught out in it. Wasn't it, though. I'm glad you got the rain without any of the damage, the rain is so badly needed (what climate change, Mr Abbott?). I'm glad it happened before I left work, it would have been really scary to be out in it. That looks terrifying! So glad you're safe and sound. Thank you! It was pretty frightening, and as I said to sunray I'm glad it happened while I was still at work, and not on my way to the bus stop or on the bus.